I get it. 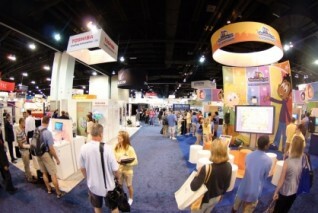 Some of the larger conventions have literally hundreds of booths full of books, videos, software, and gadgets all designed to help you educate your kids. And that doesn’t count the folks baking bread, blending smoothies, or playing chess. But remember: options are good. Don’t miss any of our great posts on writing, grammar, and language. SUBSCRIBE NOW.Every family and every child is unique, and it’s a great benefit to the homeschooling world that there are enough curriculum options to choose from to accommodate your particular needs, interests, and inclinations. Hundreds of vendor booths might seem frightening, but a wide selection is far better than the opposite situation. The key is learning how to manage your time in the vendor hall. Know what you are hoping to accomplish in the coming year, and make a list of items you’ll want to purchase or programs you want to enroll in. You may also need to prepare yourself mentally for the barrage of options. Experienced conference attendees often come with a list of must-haves. Sometimes they mark the booth locations they wish to attend on the map that is usually included in the convention program. This is a great way to save time and potentially some money. 3. Know what you don’t need. Nothing helps reduce exhibit hall anxiety like knowing what booths you can overlook. Some stuff you just don’t need. One might be for children of different ages than yours, another might address a subject you don’t plan to cover, and yet another may not fit your approach to homeschooling. With a little experience, you’ll learn what products and services you just don’t need. If you know what a business offers and that you just don’t need it, don’t be afraid to tell the sales representative “Thanks, I don’t need this,” in a firm, but polite tone. We’re all used to that, and honestly, we’d rather not waste time talking to someone who isn’t really interested. Many articles on convention preparation don’t include this tip. As helpful as it is to know what you need and don’t need ahead of time, we think you should also plan to spend at least some time investigating new options. I admit, this point is a bit self-serving, but it’s also just good advice. Countless times over the past several years, I’ve practically dragged a mom to my booth to tell her about WriteAtHome, only to have her reply, “Wait, this is awesome! I didn’t know you guys even existed.” It makes me want to pull my hair out, especially at conventions where we’ve exhibited for six or more years. Maybe we don’t do a good enough job of getting people’s attention, but folks who don’t even know what we offer tend to zip past without a glance. I really do understand. No one wants to feel pressured to buy something. No one wants a sales pitch for something they’re not interested in. Sometimes you just have to put on the blinders and make a beeline to the booth you really want something from. But keep in mind that there are probably some good ideas out there that might actually meet a need in your homeschooling. You don’t need to make a purchase on the spot, but it might help just to know what’s out there. Prepare well, certainly, but keep an open mind. There might be some curricular treasures out there that have been walking right by. to summarize — a little work prior to the event will go a long way toward relieving the exhibit-hall anxiety. And since I’m on the topic, maybe you should take a few minutes right now to check out WriteAtHome.com and what we have to offer teen writers! If you plan to be at an upcoming convention where we are exhibiting, please drop by and say hello! We’d love to hear from you! Take a moment to leave a question or comment below! Hey Lois, unless it was last year (2011), the guy you talked to was yours truly. 🙂 Thanks to both you and Wendy for your comments. I’m with you, Wendy! During the last half hour or so before I left a conference (Arlington, TX) I hadn’t decided on a writing plan. I stopped at the booth, talked to the guy for a few minutes, took a brochure and left. After I got home I investigated a bit more, and signed them up. Of course, I missed the conference additional discount that year, but I needed to think about it. I love #4 – that is exactly how I found Write@Home in the first place! It’s also what makes conventions fun.